Included a chapel at Elmbridge, which was a separate Civil Parish in 1866 and a separate Ecclesiastical Parish in 1877. Dodderhill adjoins Droitwich to the north of the town. Paper Mills, a detached part of the parish of Hampton Lovett, formerly extra-parochial , it was in 1884 annexed to Dodderhill Ancient Parish, under the Divided Parishes Act of 1876....consists of a water corn mill, previously a paper mill, and 13 acres of land...it formerly belonged to the nunnery of Westwood. DODDERHILL (St. Augustine) : Christenings & Marriages 1613-42, Christenings 1651-1881, Marriages 1661-1874, Burials 1613-41, 1659-1849 [Microfiche] Published Birmingham & Midland Society for Genealogy & Heraldry Nd. DODDERHILL (St. Augustine) : Monumental Inscriptions [Microfiche.] Published Birmingham : Birmingham & Midland Society for Genealogy & Heraldry, Nd. Author Birmingham & Midland Society for Genealogy & Heraldry (transcription.) Source D: J Todd. 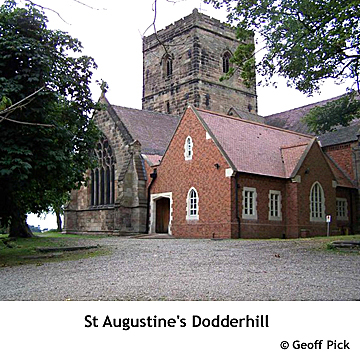 DODDERHILL, a parish partly within the borough of DROITWICH, but chiefly in the upper division of the hundred of HALFSHIRE, county of WORCESTER, ½ a mile (N.) from Droitwich, containing, with the chapelry of Elmbridge, 1565 inhabitants. The living is a vicarage, in the archdeaconry and diocese of Worcester, rated in the king's books at £ 12. 12. 3½ and in the patronage of George Penrice, Esq. The church, dedicated to St. Augustine, is a curious edifice, which having been partly destroyed in the parliamentary war, and rebuilt, consists of the north transept of a Norman church, with a chancel of later date, and a tower in place of the south transept. A free chapel, or hospital, was founded in the 13th of Edward I, and dedicated to St. Mary, by William de Dovere, for a master and poor brethren, who were under the government of the prior of Worcester, and whose lands, at the suppression of free chapels in the reign of Edward VI, were valued at £21. 11. 8.